Truman turned it around in his hand. “Young girls in their communion dresses,” he said. The remark pleased Colette. “Very charming,” she said. “Very apt. Now I can see what Jean told me is true. He said, ‘Don’t be fooled, my dear. He looks like a ten-year-old angel. But he’s ageless, and has a very wicked mind.’ ” She gave it to him, a souvenir. (Sam Wasson, Fifth Avenue, 5 A.M.: Audrey Hepburn, Breakfast at Tiffany’s and the Dawn of the Modern Woman, HarperCollins:2010). Capote kept that white rose paperweight with him wherever he lived. And not for its utility. It was a memento of his meeting with Colette: an allusive conjuring of the past he could hold in his hand. He collected paperweights for the rest of his life and carried those he liked the most with him in a small black bag. While glass as a utilitarian and art medium dates back to a least 2500 B.C., the first signed paperweight is rather new: it can be traced back to 1845 and Pietro Bigaglia’s signed weights for the Vienna Industrial Exposition. A few years later in 1851, paperweights showed up in the Great Exhibition of the Industry of All Nations in London’s Crystal Palace. This exhibition was intended to showcase innovations of artists from “All Nations.” One of the New Things was the paperweight. This huge event, as well as subsequent world fairs, served to introduce paperweights to the world. Certainly there was a utilitarian aspect to this new object: letter writing had become all the rage in Victorian England. A daily epistolary habit required desk tools beyond pen and stationery: something to keep lightweight loose letter pages neatly in place in drafty houses. A heavy glass sphere did the trick. All the better if it was attractive or commemorated something—such as a coronation of Queen Victoria. 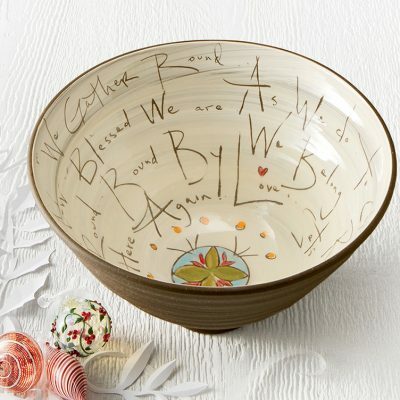 Paperweights sold well: they were trending! 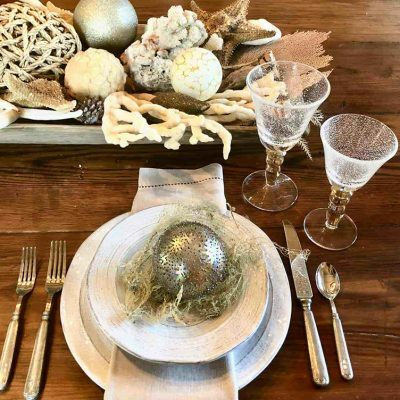 Though the first primitive glass paperweights made in Venice were often rough spheres incorporating end-of-the-day colored detritus at the glassworks, French, English, and Bohemian glassworks quickly became known for their extremely well-executed and beautiful paperweights. Especially in France, 1845-1860 marks the “classic” period” of paperweight making. The production of exquisite paperweights became part of an attempt to revive the country’s depressed glass industry. Consequently, four company names are associated with this revival: Saint Louis, Baccarat, Clichy, and Pantin. Their designers and artisans developed prodigious virtuosity in ancient glassworking techniques. “Antique” paperweights are from this “classic period.” The “American Classic Period” of paperweight making stretches from 1852 to 1870, continuing after the excitement had declined a bit in Europe. The “modern period” of paperweights begins around 1950 and extends to the present. In the early 1960s, the Studio Glass movement began in the United States as glassmakers moved from factories to studios. 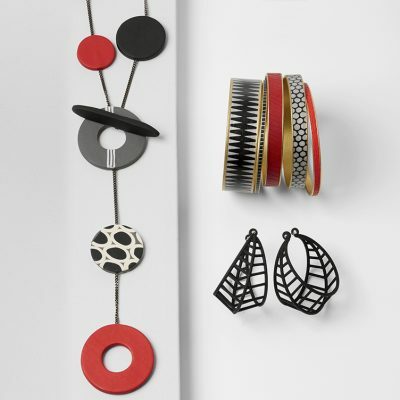 Glass work in studios shifted from the utilitarian to the aesthetic: to art glass. The range of ancient and innovative techniques and processes used to create glass paperweights today is wide and varied. While the name with its lowly intention remains, the paperweight quickly broke free of the realm of utility and became, instead, the showcase for the most magnificent and refined examples of glassmakers’ workmanship. Most paperweights are never “put to work.” They are small enchantments in glass: extraordinary design and craftsmanship revealed. 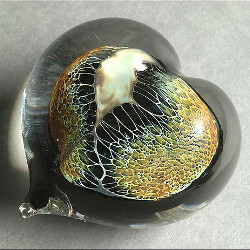 The products of the ancient glass techniques of canework and lampwork are fascinating to see. Canework calls for the stretching of colored glass into long thin straws that are cooled and then cut into smaller pieces. The artist uses them to create colors and shapes in a larger glass project: it’s the creation of the “crayons” the artist uses. Rods of many colors can be pulled together to create multi-colored canes. These are cut into thin slices that resemble flowers and are placed in the work. This technique is called millefiore (“thousand flowers” in Italian). 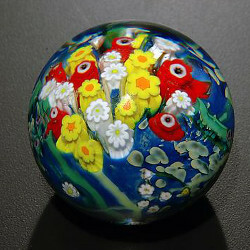 Many paperweight artists in Artful Home use millefiore in their artwork. Michael Egan builds undersea reefs. 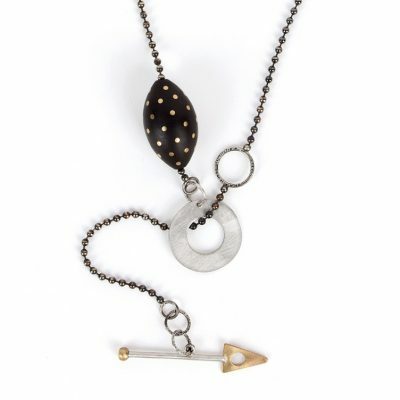 Shawn Messenger is known for her lovely flower-filled heart-shaped weights. David Lindsay, Paul Harrie, and Ken and Ingrid Hanson all employ straight canework or millefiore, though their works are diverse. Lampwork is very different. “Lamp” refers to the torch the artist uses to keep bits of colored glass molten as an object takes shape. That object could be a flower or butterfly—most traditionally—but also a salamander or, for example, Clinton Smith’s poison dart frogs. Extraordinary realism can be achieved with lampwork, and many artists are virtuosos in representing flora and fauna. 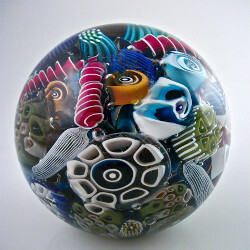 More lampwork can be seen in the work of Jeremy Sinkus, Aaron Slater, Richard Satava, and Mayauel Ward. Aaron Slater using a torch to work with glass. Beyond these traditional techniques, some artists apply gold leaf to the hot glass for the delicate lacy pattern that forms on the surface. The work is then encased in another layer of glass. 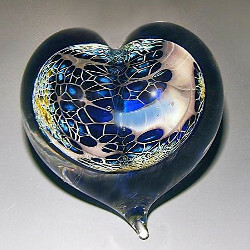 Robert Burch’s heart paperweights showcase this method. Paperweight collecting is popular: many people have found it enjoyable and even addictive—an addiction that’s not unhealthy! There are many paperweights out in the world in every price range, and unlike so many other forms of art, they require no special upkeep or storage conditions. There are three large collections of paperweights in the United States: at the Corning Museum of Glass in New York, the Arthur Rubloff Collection of Paperweights at the Art Institute of Chicago, and the Bergstrom-Mahler Museum in Neenah, Wisconsin. All three are very popular destinations.